Khabib Nurmagomedov’s father wishes to put the beef with Conor McGregor behind him and his son’s team. 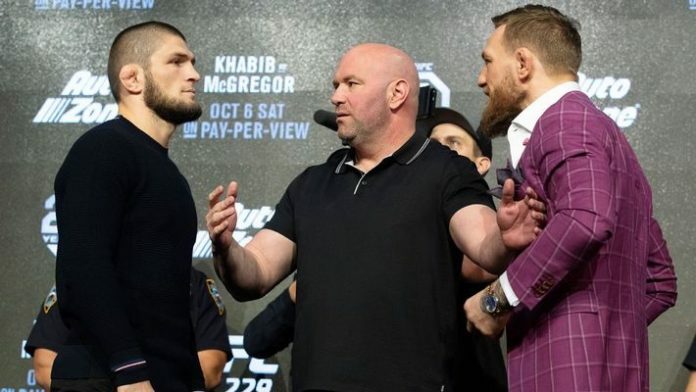 The feud between Team Khabib and Team McGregor has gotten ugly and many are hoping it peaked at the conclusion of UFC 229. Nurmagomedov submitted McGregor, but that wasn’t enough for him as he leaped into the crowd to get a piece of Dillon Danis. Then Nurmagomedov’s teammates went after McGregor inside the Octagon. Nurmagomedov will have to deal with the Nevada State Athletic Commission as will McGregor. Both men face disciplinary actions for the UFC 229 brawl. McGregor’s penalty is expected to be far less than Nurmagomedov’s. As it stands now, McGregor received his $3 million salary but “The Eagle’s” $2 million check is being withheld. McGregor’s coach John Kavanagh recently said he hopes Nurmagomedov receives a light punishment. He even went as far as to say that Nurmagomedov’s actions weren’t a big deal. Time will tell if Nurmagomedov will receive a stiff penalty. Do you think the beef between Khabib Nurmagomedov and Conor McGregor will cool down?